The options around Hoe and Shovel for sunny locations adequate enough for standard roses are scant at best. This consideration along with a dose of apprehension for the care they typically require is my excuse for not collecting these lovely specimens in the past. For many years the shady parts of this garden have increased steadily as trees have matured and subsequently shielded almost every bit of direct sunlight. High shifting-shade that, I should note is decidedly appreciated in almost every instance, serves as the overarching environment and thereby provides the basis for choosing the permaculture. When the very large drake elm was removed in late winter it became anyone's best guess as to how the loss would fully effect the exisiting underplantings once the daylight stretched into summer's longest hours. One thing was for certain ~~ there would be some surprises and some adjustments to be made. 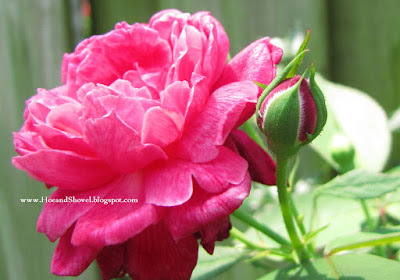 In May I surprised myself by taking a chance with the purchase of a Knockout Rose Tree. It wasn't in great shape, as it was left over from the fall, and was looking a bit bedraggled. Tied to a pole to hold it upright at the garden center it was evident it needed a good home. That one lone rose tree found its new resting place in the sunniest spot of the back garden where the drake elm used to keep everything nicely sheltered in the shadows of it sprawling limbs. All the branches on that pitiful rose tree were pruned right away to an ugly, small sphere. Organic nutrients of blood meal and bone meal were added to the soil and it was watered sufficiently. Almost two full months later it is finally resembling a real rose tree. Sited prominently only 20 feet beyond the back lanai and visible from the kitchen window I'm thrilled it decided to become recognizable. We guard against getting too overly excited until we measure how well a plant fairs through a few seasons. In this case the test will be summer through winter. Once it decides to stick around for a while and also performs well then we are more than obliged to pronounce all accolades due its achievements. Depending on which direction you gaze, if you allowed your eyes to wander beyond the rose tree to the east, the circle garden would be almost in full view. Following the circle garden leads one to the tropical pathway which can be seen partially to the upper middle/right in the above photo. From the circle garden there are more trailing pathways to the wildflower garden, butterfly garden, and the back "20" as well. All that sounds like more than it is but those are the names we've come up with to identify the borders and planted-out areas. Serving as the hub of the circle garden is the very large container planter now being over taken (in an acceptable way) with Euphorbia leucocephala 'silver fog' and ornamental potato vine, Ipomoea batatas 'Margarita'. Being it is impossible to capture the widest views on camera it will hopefully suffice to have a look around in segments. It has been drizzling rain off and on for the past many days. No complaints here... we are loving the natural irrigation and a break from dragging hoses around. The Gaura lindheimeri 'Whirling Butterflies', are just on the other side of a short walk-through, marked by stepping stones, from the rose tree. 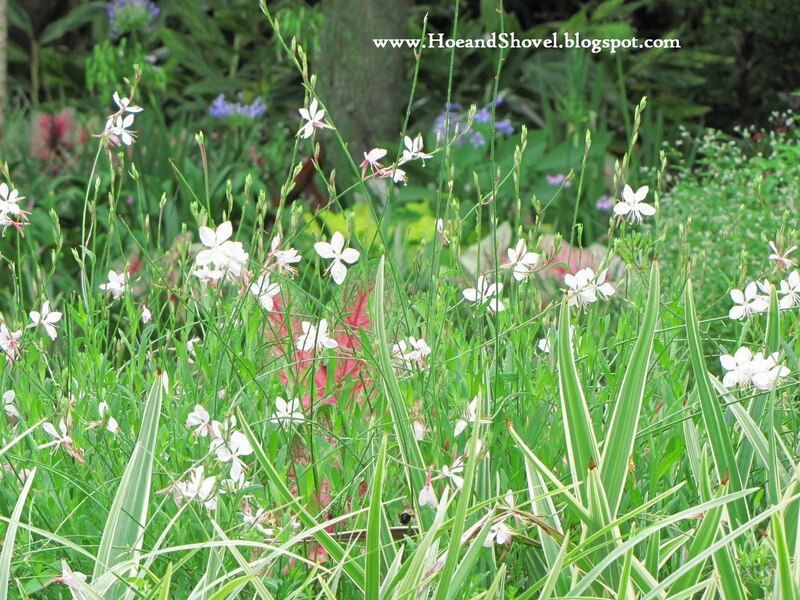 I'm loving their wispy, airy habit crammed in between flax lilies that border them. The flying insects are perpetual visitors to the consistently blooming flowers. 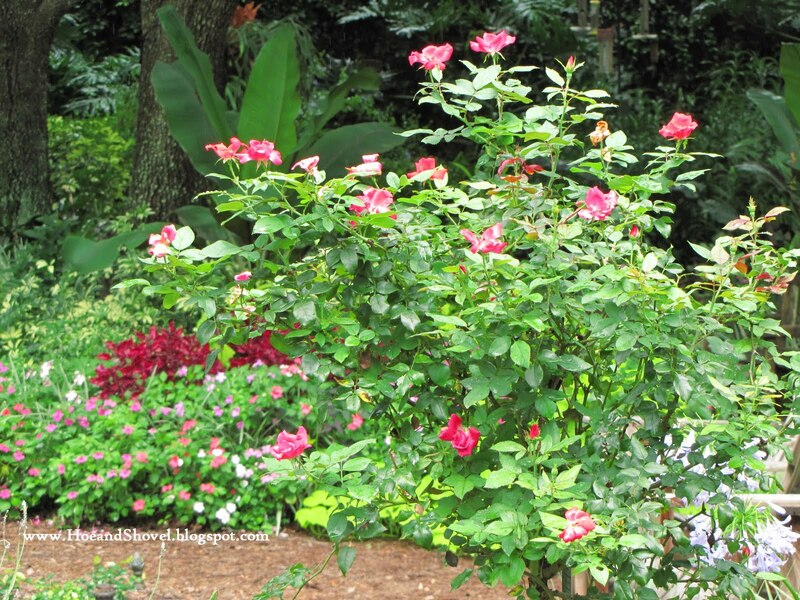 To the south and at the feet of the rose tree is a large planted out border with mixes of variegated liriope, agapanthus, dragon-wing begonias, variegated schefflera, container plants, a ligustrum tree, mexican petunia (boo), jewels of opar, and caladiums. 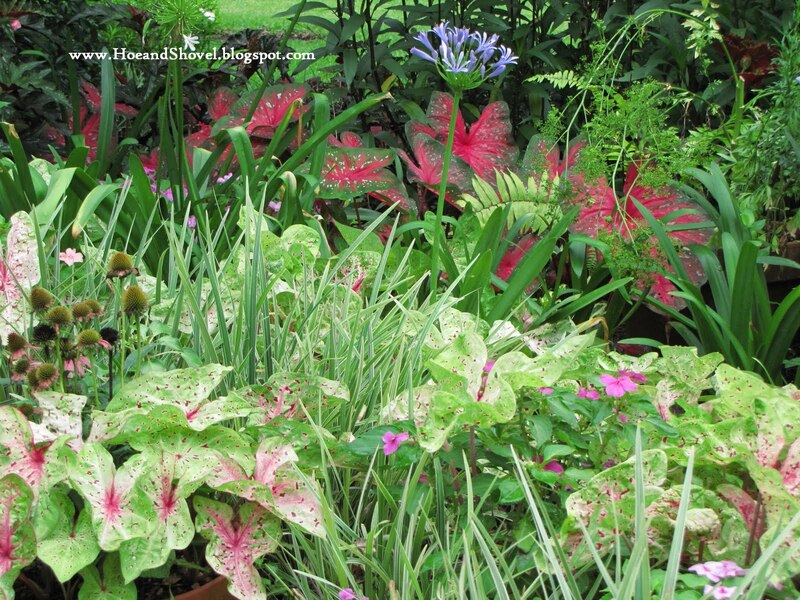 It seemed like it took forever for the caladiums to come back this year. Hundreds more have been newly popped into the ground for increased impact and summer bursts of color. Those have not yet made an appearance. While we're talking roses it's worth noting that there is one other rose growing here. 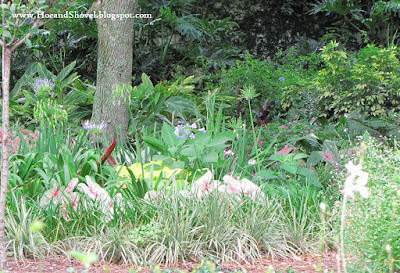 The Louis Philippe Antique Rose was first spotted at the Florida Native Plants Nursery in Myakka, Florida growing in the midst of winter wildly up through another tree in a partially shady spot. It peaked my interest with possibilities so that I was certain it was the rose for me and kept my eye on the lookout for it after that. Again in my cautious fashion only one was decided on several months later. That one planted almost exactly a year ago. It has grown from 18 incles to 5 feet in that short time. It is a keeper and one I will add more of to the garden ~~ at some point. 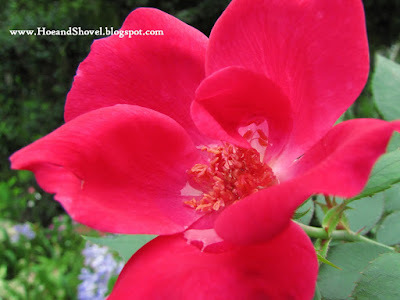 It's been said that a Texas statesman, Lorenzo de Zavala, collected this rose during his 1834 stint as Minister to France and planted it at his home in Lynchburg. God bless America! Happy Birthday, sweet land of liberty. Gorgeous roses! I'd grow them if I had more room, my garden is very small. I love all the colors of your garden. Hmmm, two roses...two great choices. I see a new obsession beginning. My mom has rooted the cracker rose from cuttings and last year I sawed off a low branch and realized it had rooted into the ground. The new plant was 3 feet high and transplanted well. Your garden looks great and appears to have made a full recovery from our nasty little winter. Good luck with your roses. In small spaces you have to pick and choose almost the same as not having much direct sun. I've seen roses growing beautifully in containers, too. Maybe that would work for your small garden. Yeah... only two for now. I'm hopeful I won't get obsessed with them like so many other plants ~~ I can be guilty of that. Rooted from cuttings? I'm going to try that right away... what's to lose? A couple roses here too. Gifts from Brother. We're going for Knockouts now. I hope you had a wonderful 4th. Happy America B'day, Meems! (And I'm a Brit!) I recently discovered Knock-Out roses will do really well in S. Fla., too, so I've got a couple thriving in large clay pots. I'm also growing a Louis Phillipe, but it doesn't look as happy as yours. I've got a Souvenir de la Malmaison a few months back, and it's beginning to show new growth. Fingers crossed, because I LOVE roses. BTW, I'm feeding the old roses rabbit food! Yay for your roses. I don't have much luck with them either. I will look up the second one you mentioned. I doubt if it would grow here but it sure is a beauty. I have always liked those rose trees. I have tried a couple of them over the years. Of course they didn't make it here. Sigh~~ I hope you enjoyed the fourth. As long as you don't have Japanese Beetles, your roses should do well, I'd think. I like the tree form and I have Encore Azaleas grafted that way which frees up the ground underneath for more plantings. I do the same with the "buy one to try" in the deer resistant garden. Glad you are getting rain. Our cool front has moved out and we're back to a forecast of 5 straight days of 95+ heat with no rain. Meems, I love the color of your roses. I transplanted two rose plants from the west to the east side of the house a month ago. They aren't blooming yet but at least they are starting to develop a few new leaves again. --- When will it stop raining so we can get outside again? Love your rose tree. I bought an Australian fern. I hope I don't kill it. Looking forward to some drier weather. If I don't see you, have a great time in Buffalo. Your rose tree is doing so well and blooming so profusely. It must be nice to be able to see it from your lanai and back window. A gardening friend just gave me a rooted cutting from her LP and it has a bud! It's the ONE rose I originally planned to plant but now it is joining FIVE others. My obsession must end for now because I have run out of sunny, well-draining space. The other areas of your gardens look all back to normal from the winter set-back. 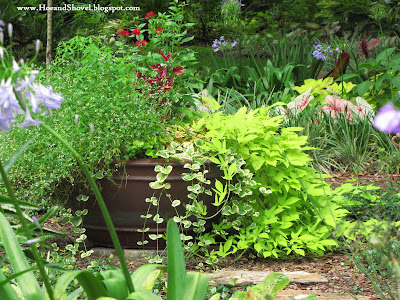 The new circle garden pot is exploding! I love it. Jon has fallen in love with the Knock-outs. (those are his part of the garden-I stay away).He would love your Knockout tree.So would I. Beautiful, Meems! That rose tree is grateful to you for giving it a home! Hi, Meems. I've been following your blog since I moved to Florida two years ago. I am an avid gardener, and I am slowly taking out most of our yard as well. I love native plants, but am still a sucker for those that aren't. I am looking for the pagoda flower, and I can't find it anywhere. Can you tell me a good place to acquire some? Unfortunately, I haven't made enough gardening buddies to get it as a pass along, which is how I've always gotten plants until we moved here. 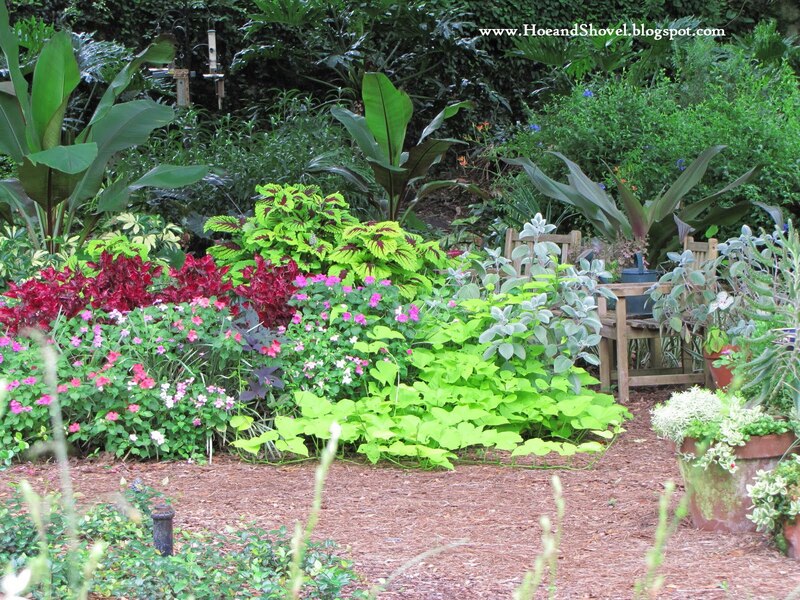 I also would love to know if you would divulge some of the nurseries you shop at. Your page is awesome, and it's inspired me tremendously! I think you planted the two best roses for Florida and they look great. Your tropicals look great and with all this rain they will really be growing. I've got a question for you. When you plant caladium bulbs this late in the year, how quick do they pop up? Roses are close to my heart. I have grown dozens over the years here in Florida. I gave up on Tea Roses years ago due to the fact I am totally organic in my garden and I do not spray pesticides or fungicides. However, having said that: The OGR's grow beautifully here in Florida. I have about 6 Louis Phillipe, and they bloom their hearts out year round. One is even being overgrown by another plant and I have let them duke it out. 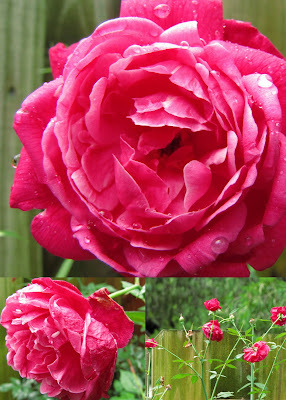 The rose continues to come back year after year after being pruned and it is also in part shade. I also love English roses and have Abraham Darby which is a beauty. Mrs. BR Cant does well also and is a nice pink. My favorite in our garden is the Don Juan. I have two planted on the arbor that is the entrance to my front yard garden. It has a short repeat cycle and is a beautiful red. Against a deep green arbor, I love to see its' beautiful blooms! Enjoy your roses. Your garden is so beautiful, I know you will do well and love them. 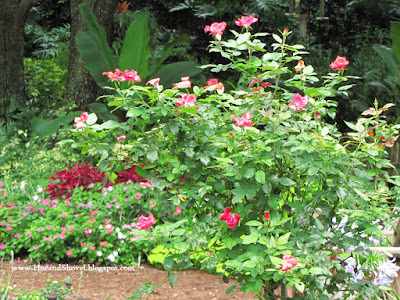 Oh, the cracker rose is native to Florida and will take over your garden. If you have a fence to plant it on, it will do well also. I dug mine out as it only bloomed once a year and the thorns were horrible. I believe it was used by farmers as a hedgerow to keep animals and intruders out. With those thorns, it would work great. Just one...now two...that's how it starts! :) Your rose tree is a beautiful addition, and obviously thriving in your showstopping garden! Very nice! Hi, Meems! Just catching up on my reading, and I've discovered I posted the same two roses today. 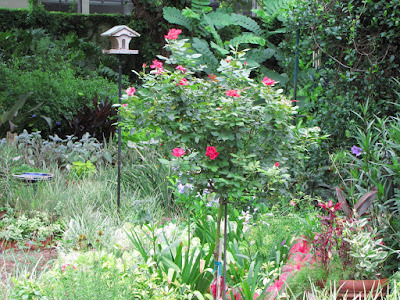 I have two knockout rose trees I purchased several seasons ago, and they are doing just fine. The knockouts have disappointed me overall, as they do tend to get diseased leaves on occasion, and they look pitiful during winter. The 'Louis Philippe,' on the other hand, is a clear winner! Love, love, love that rose! Wonderful scent and never a problem. And they are the easiest thing on earth to root. Lovely garden views, by the way. I agree on the caladiums...they were late to return this year. I have read that the old china roses like Louis Phillippe do the ok in the conditions found here. I have not yet encountered one but yours looks like it is doing well. Nice Pics! Your roses are beautiful additions Meems. It's fantastic how well the rescued knockout recovered with your loving care. Knockouts seem to be the ticket for self-cleaning roses. Of course if you DO prune them they bloom a bit better and faster. You didn't mention how long you had your LP but it took mine a few months to settle-in and then it took off from there. My fingers are still crossed for the rose tree. It really needs to steadily do well for me since it is kind of front and center from several vantage points. :-)Thank you for comment. 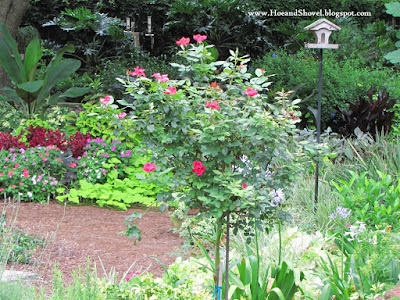 I have had a couple of tea rose trees in the past that didn't last long enough for me either. Giving the KO's a try is a gamble but probably higher chances for success. I envy those folks who just do roses so well. No Japanese beetles here in the past. I hope the rose tree doesn't beckon them. You are just so adorable. Your tree fern will do just fine. Mine has not come back from the freeze like it did last year. I am sad and not even sure what to do about it. I think the rain and the blooming were coincidental but the tree really broke open more buds this weekend. From what I understand the Knockouts don't love lots of water? I might need to re-check that information. Anyway, yes, it has been nice to see it from the kitchen window and the lanai. I'm so thrilled to hear the LP roots from cuttings. I can't wait to try that out. I need to pick Jon's brain. You are sweet to say that... and I'm happy I brought it home, too. I can't say I was thinking that from the beginning. Thank you so much for leaving a comment after all this time following. It is my pleasure to make a connection with another Florida gardener. I know how difficult it must be to try to learn to garden in Florida after gardening just about anywhere else on the planet. We have very different conditions here that can be challenging. 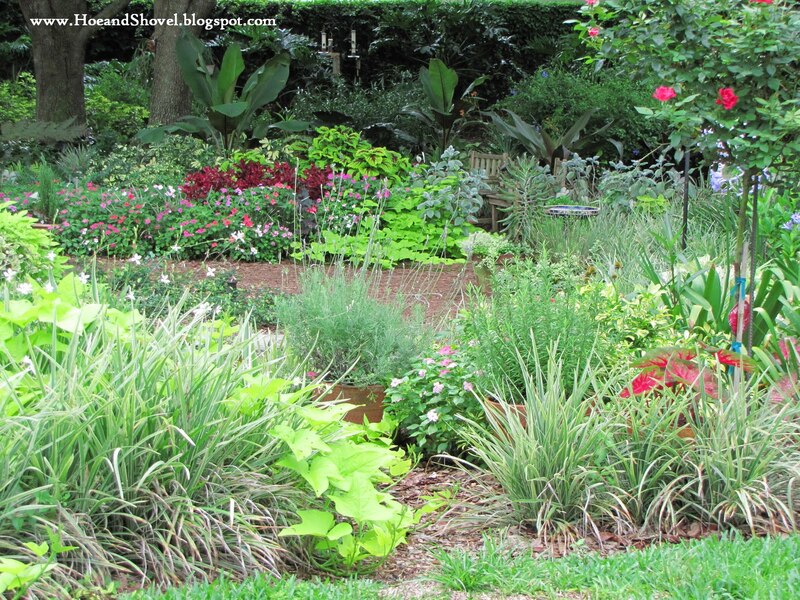 I'm in love with natives as well but my favorite thing is to mix them with Florida Friendly plants to get the most out of the design appeal. I've never seen the pagoda for sale in a garden center. But I do know where you can come to dig some up... I've got plenty of little seedlings popping up everywhere. 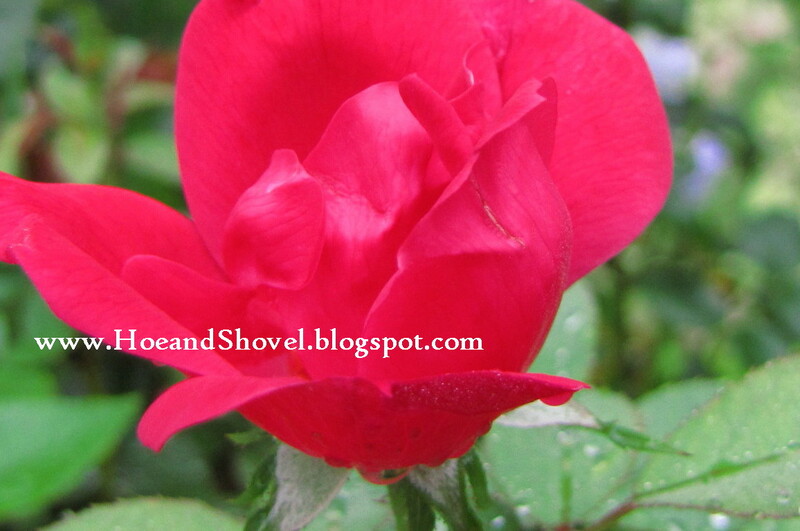 e-mail me at hoe and shovel garden at g mail dot com. Happy to share. My very favorite garden center is Duncheons garden center on Hwy 41 just over the Pasco Cty line. Then there is Pine Lake on Dale Mabry~~ not your typical pretty displays but they have VERY reasonably priced foundational type plants (and they stock natives). Their website has a great list of available plants and they always have good sales/specials. Those two are pretty much my mainstays. But I'm a garden center hound... always checking them out (at least to see what they have). Not always buying but always comparing stock and prices. Hope that helps. Funny you mention the Don Juan. I was so tempted so many times this spring to purchase that one from the garden center. They are stunning but I knew I didn't have a suitably sunny place for it to climb. Still enamored though so maybe in the future. I need an arbor in a sunny place. Your roses sound delightful. Don Juans on the entrance arbor would be so wonderful. I can imagine they are just gorgeous. I was under the impression that cracker roses and Louis Philippe were the same rose... is that not true? Isn't it the truth... it's a good thing I don't have enough sun for them. They could easily become a favorite if they do well. I'm a little surprised to hear your take on the KO's in winter. It seemed to me they do really well in the cooler weather. 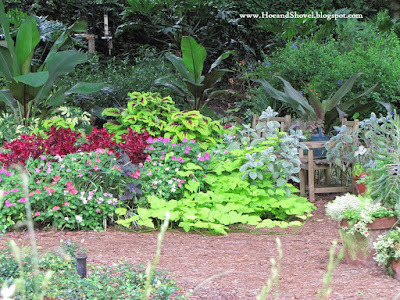 I see them used as median shrubs in North Florida they are so hardy and in the winter look stunning. Thanks for the tip on rooting the LP... must give that a try right away. With the plentiful sunshine at the sandpit you could probably really grow some nice roses.